Create real world applications using this in demand Web Development framework. Understand Rails core "7 methods"
So maybe you tried out Ruby on Rails, but found it too hard and feel that you need a more comprehensive introduction. Maybe you have worked a bit with Ruby and want to further your skills with the language and learn web development with it and Rails. Perhaps your boss or client threw you in the deep end with a Ruby on Rails project, and you need to learn about Rails fast? Or maybe you just decided you would like to add Web development and Ruby on Rails to your resume to give yourself some better opportunities. If so, you are in the right place. This course is going to teach you how to create web applications using Ruby on Rails. .
Ruby on Rails is a super fast and productive way to develop web applications. It simplifies common repetitive tasks that take a long time to create in other languages. The framework is mature because it has been built on solid foundations. 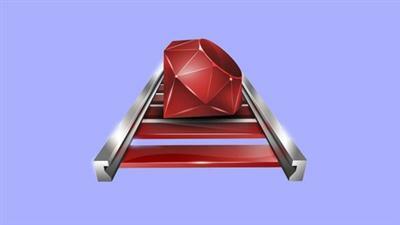 It's much easier to get a high-end product completed in Ruby on Rails than in other languages. Because it's mature there is a ton of open source projects/code you can use that are extremely powerful and really give you an advantage in build solid web applications. Plus it uses the Ruby programming language. Ruby programming code reads like English and that makes it a lot easier to understand if you are just starting out as a programmer. As a dynamically typed language, Ruby does not have all of those hard rules other languages do, and in many respects is similar to spoken languages. This empowers you by giving you flexibility to solve problems in a more human way than other programming languages. Bootstrap 4, Rails Generators, User Autorization, User Authentication, Content Management, Deployment, Seeding the Database, Sending/Receiving Email using a Rails Application, Configuring Sidekiq, Configuring Redis on Heroku and a private server, Installing Templates, Custom Validation Messages, Adding Assets to the Rails Pipeline, Uploading Images on your own server, Uploads to AWS, Adding a WYSIWYG - What You See Is What You Get Editor and more! This courses uses non complicated examples to do complex things. The goal is to get you to understand exactly what you are doing and the reasons why, rather than typing in code you don't understand. No code is glossed over, as it is important for you to understand what each line is doing. Your instructor, Stephen Chesnowitz became a fan of Ruby and Ruby on Rails back in 2012 and dove in head first. Over the years he has worked on some pretty cool projects, and is here to share what he can and help you along your path into the world of web development using Ruby on Rails. As a result you are dealing with someone who not only knows the Ruby language and Ruby on Rails really well, but has the skills to teach things in a way that anyone can understand. After completing this course, you will have the necessary skills to be able to create your own web applications using Ruby on Rails. The sooner you sign up for this course, the sooner you will have the skills and knowledge you need to increase your job or consulting opportunities. Ruby on Rails developers are in high demand! Ruby on Rails for Beginners Fast Download via Rapidshare Hotfile Fileserve Filesonic Megaupload, Ruby on Rails for Beginners Torrents and Emule Download or anything related.